This week the Friday Mashup Challenge put me right into the fall spirit. The weather near Georgian Bay has been cool all weekend and there is no break in sight. I don’t mind though, I’m cozy inside with my pups, Zip & Zoë (Z²). Ok, so the FM177 challenge this week was to create a project that followed a sketch, or to create a project with ‘leaves’, or mashup both challenges into one project. To make this card, I started in Silhouette Studio and created the leaf stencil, the stitched circle, and the leaves. With my Silhouette Portrait I cut the leaves out of Cotman 140lb watercolour paper and the stencil from a scrap of cardstock. 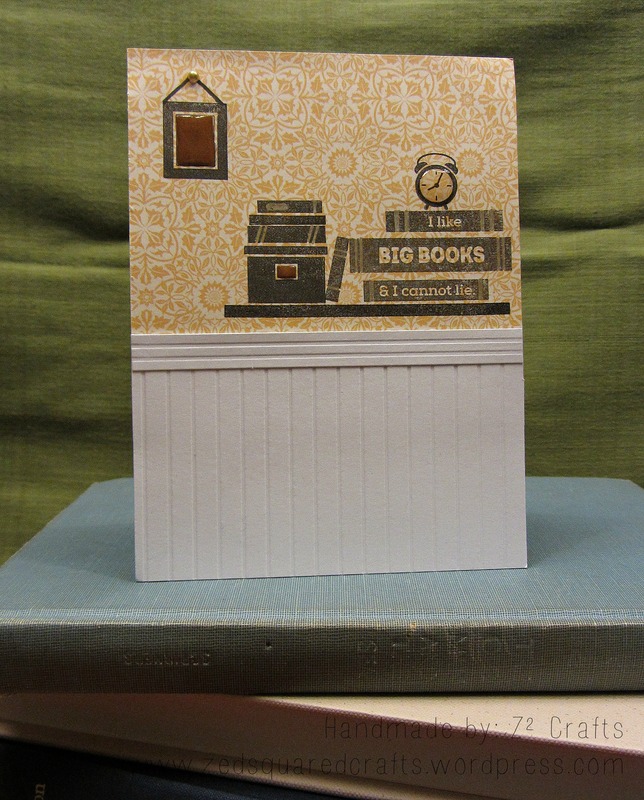 I cut a piece of 120lb white cardstock to 4″ x 5¼” to use as the background. I temporarily adhered my stencil to the background and covered the edges with Post-It tape before I used a makeup sponge to sponge on Gathered Twigs Distress Ink (yes, my one and only). To add just a touch of sparkle and dimension, I smushed on some bronze ink then removed the stencil. Before I put my sponge away, I sponged the edges of the white background and the vellum circle with my Distress Ink. I used my Staedtler watercolour pencils to paint my leaves. After giving them plenty of time to dry, I used a balled up piece of wax paper and the Gathered Twigs ink to dab on some speckles. Once the ink was dry, I used my bone folder to score some vein lines onto the leaves. I adhered the vellum circle over top of the stenciled leaves using tiny drops of Tombow Mono liquid glue on the white areas of the background. I tied a small bow with twine and then adhered the leaves and bow using Tombow Mono liquid glue directly over the vellum. To add a bit more dimension, I curled the edges of the leaves with the help of my trusty bone folder. Using SSS Lipstick Red ink, I stamped the Thankful sentiment from the SSS Favorite Flowers set. I mounted the whole card on a red-brown A2 card and called it a day. Thank you so much for dropping by! Have a great week! I hope my Dad isn’t reading this because this week I combined his birthday card into the Colour Me…! Challenge blog’s challenge and I don’t want to spoil the surprise. The CMCC#37 is to create a striking project that incorporates honey (yellow), and teal. I’m sure it will be obvious when you see the card, but my Dad is BIG into fishing. The we did a family summer holiday this year and when we were there my dad and I were trying to come up with some terrible (read: great) fishing puns. I can’t even remember if we came up with this one or not, but here you have it, my CMCC#37 card, Fishing You a Happy Birthday. This card is pretty straightforward and most of the time creating it was spent in Silhouette Studio. All the shapes were free (either they came with the machine or tracings of free clip art) or ones I created myself. 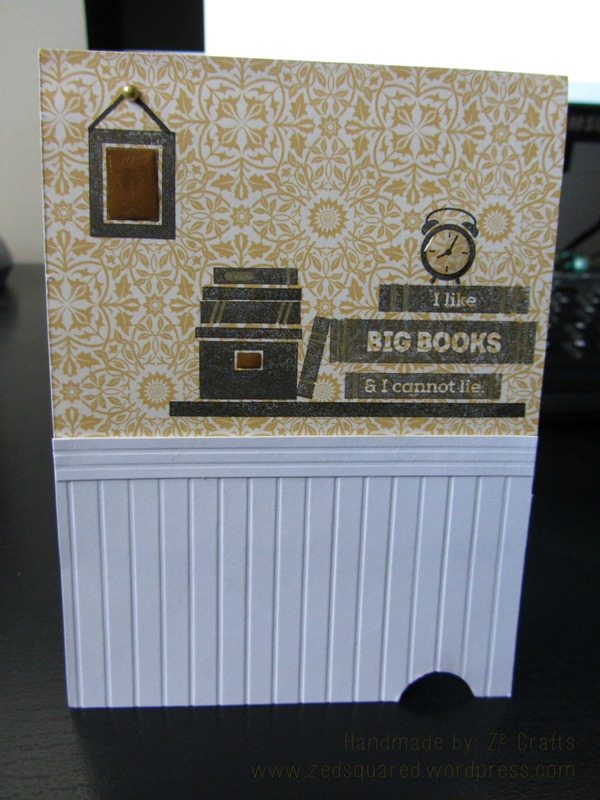 I used a selection of patterned paper (including the wood grain background) from My Mind’s Eye 6×6 Reunion, paper pad. The one polka dot fish was cut from a scrap. Stitched borders are all the rage right now so I jumped on the bandwagon and used the Silhouette to cut perforated lines on my banner and round background piece. I just love how the stitching gives a subtle detail to the finished project. After I cut out all my elements of the card using my Silhouette Portrait, I glued the two ‘happy birthday’ cuts together to create the dark grey shadow. Next, I tied grey string on each of the tails of the fish and assembled them in the order I wanted them to hang. 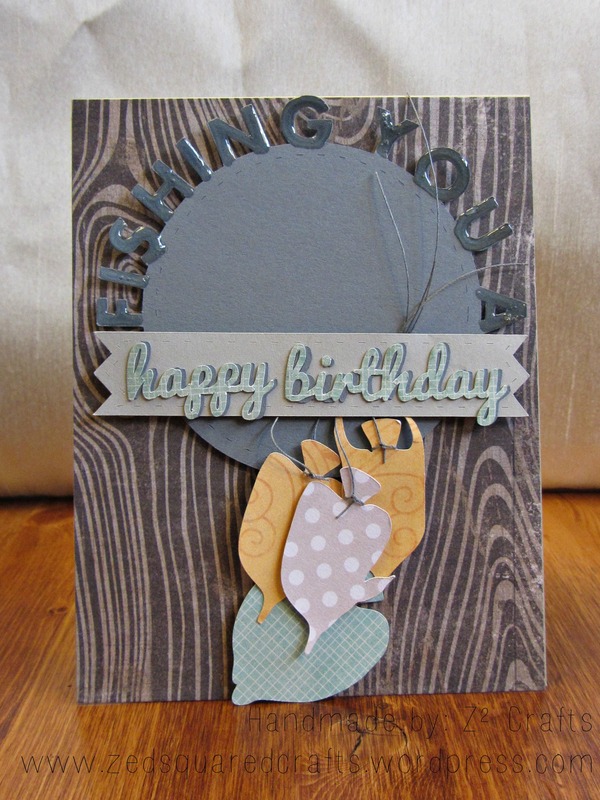 After assembling my card using a combination of foam tape and Tombow Mono liquid glue, I used Ranger Glossy Accents around the ‘fishing you a’ part of the sentiment to give the card a little shine and that was it. Thanks so much for dropping by. I kind of skimmed over the Silhouette Studio part of the card so if you have any questions please leave me a comment or send an e-mail and give you the full scoop! So, emboss resist is the process of heat embossing an image and then applying ink over top. The embossed areas resist the ink and stay vibrant. I’ve mostly seen this done with white embossed images, so I wasn’t sure if using coloured ink and clear embossing is strictly considered emboss resist, but hey, why not? I cut a 4″ x 4″ white cardbase and protected the back of the card with some strips of Post-It tape. The Post-It tape also helped the card stay in place while I stamped and inked. Using one of the book stamps from the SSS To Thine Own Shelf set, I stamped with three colours of pigment ink from my Color Box Petal Point, Enchantment. To emboss, I used Ranger Superfine clear embossing power. I stamped and embossed one colour at a time and used my homemade anti-static bag in between each colour. I wasn’t happy with how some of the books had embossed so I stamped over them with VersaMark ink and re-embossed to make sure my resist would work. Once I was content with the embossed background, I used Gathered Twigs Distress Ink and a makeup sponge to cover the whole card front. Just for good measure, I added some water droplets for a bit of a more distressed look. This ink came in the card kit and it’s my first time ever using Distress Ink. I think I might be hooked. My resist technique isn’t perfect but the Distress Ink helped smooth everything out and dried beautifully. I used a scrap of patterned paper (also from the kit, October Afternoon, Public Library) and some stickers to finish off the card. I wanted to pop up the sentiment but since it was a sticker I rubbed some baby powder on the back before applying my foam tape to make sure none of the edges got stuck down. I took an extra long Labour Day weekend to visit my family so I didn’t get a chance to craft much last week. There is no better way for me to get my creative juices flowing again than a Colour Me…! Colour Challenge. I love playing along and this week the CMCC#36 was to create a card that uses only yellow and neutrals. To start, I trimmed a piece of white cardstock to 2½” X 4¼”. I used my Martha Stewart Mini Scoring Board to score at ¼” intervals to make the wainscoting texture. I trimmed another piece of white cardstock to about ¼” x 4¼” and scored it at 1/8″ intervals for the trim piece. I have to admit that the scoring wasn’t all smooth sailing and I did mess up (more than once!) because the paper kept slipping on my scoring board. In the end, I used a little bit of tape runner to hold the paper in place and that worked like a charm. I cut a piece of yellow patterned paper from the kit (October Afternoon, Public Library) to 3″ x 4¼ and adhered it down to my craft cardbase. Using my glue runner, I adhered down the wainscoting and trim. Before I began stamping, I lay out the stamps on a scrap paper cut to 3″ x 4¼” (the same size as the patterned paper) to plan the design. Once I was happy with the layout, I stamped the card using a black pigment ink. I think a dye ink would have have a smoother finished look but I don’t have one so I just ‘went with it’. I stamped the shelf first and clear embossed it, and then followed with the other images starting closest to the shelf and moving upward. After I stamped the frame, I used a black marker to draw the strings and a gold marker to colour a pearl for the nail. 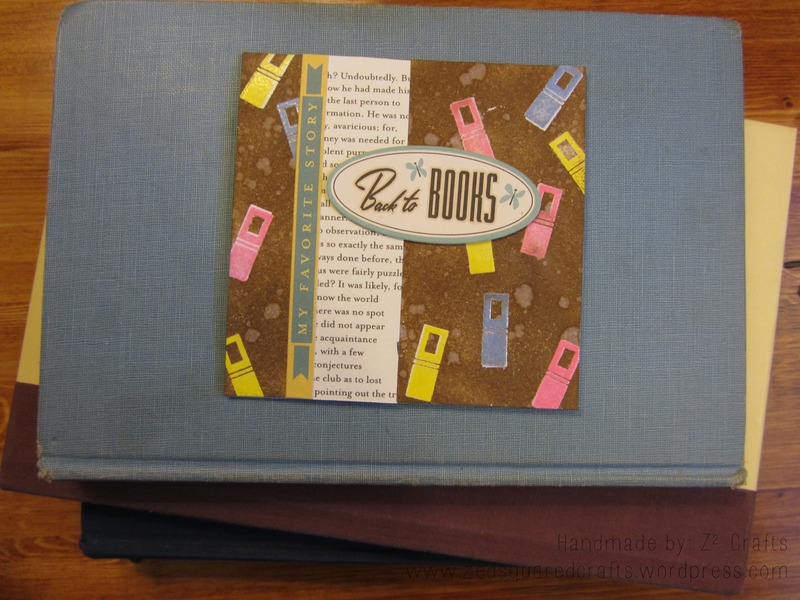 I used the same gold marker to fill in the lines on the book bindings because I didn’t like seeing the patterned paper through. I used scissors to cut the brown insert for the frame and box and adhered them to the card using my Zig 2-Way Glue Pen. Once I gave the ink plenty of time to dry, I added Glossy Accents to the frame, box, and clock for some shine and texture. That’s it for now. Thanks so much for dropping by! Hope to see you here again soon! **Edit** Since I posted this card, I’ve gone back and cut a tiny mouse hole at the bottom of the card. I wasn’t sure this would work so I waited until after I photographed it. I think it adds a cute touch of whimsy.